Wondering what the office hours are of your neighborhood urgent care? Just put your zip code into our convenient office finder and find hours, address and phone number of all FastMed clinics nearby. Even when you’re feeling under the weather, finding time to see a physician isn’t always an easy task. Most people are juggling a busy schedule of work, a social life, and a family. It can be difficult to find the time to care for yourself, so when a non-life-threatening medical issue needs to be addressed, there’s no better place to go than an urgent care. Some urgent cares are open 365 days a year, offering expanded urgent care hours that extend beyond the typical hours of many physicians’ offices. Experienced medical professionals at FastMed Urgent Care are available whenever you are, providing quality, personalized care for all of your basic health needs. What are FastMed’s Urgent Care Hours? 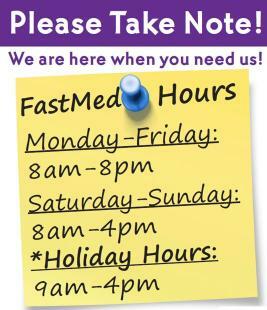 FastMed is open seven days a week, including holidays and weekends. Depending on the location and day of the week, facility hours of operation may vary. It is typical for FastMed to remain open until 8:00 PM on weekdays. What medical services does FastMed offer? How will I pay for my visit? Most major insurance carriers are accepted, in addition to most credit cards and personal checks. If you do not have insurance coverage, learn about the FastMed Discount Program to learn if you qualify. Do I need an appointment to be seen by a FastMed medical professional? Our goal is to see all of our patients within an hour of the time they walk through our doors, no appointment necessary. If you happen to be in a hurry, we offer an online check-in service that may reduce your overall wait time. At FastMed, we aim to provide the highest quality care for even the busiest of schedules. Our extended urgent care hours, attentive staff, and affordability make FastMed the best solution for non-life-threatening health care. Check out our list of locations to find a FastMed facility near you!